The main focus of high performance Ford fans attending the 2019 North American International Auto Show in Detroit is the new Shelby GT500 Mustang, but the most powerful ST-badged product debuted alongside the new pony car in the form of the 2020 Explorer ST.
That product is, of course, the 2020 Ford Explorer ST and with 400 horsepower on tap, this is the highest performance vehicle to wear the Explorer or ST badges, while also being the highest performance SUV that the Motor Company has ever offered up. 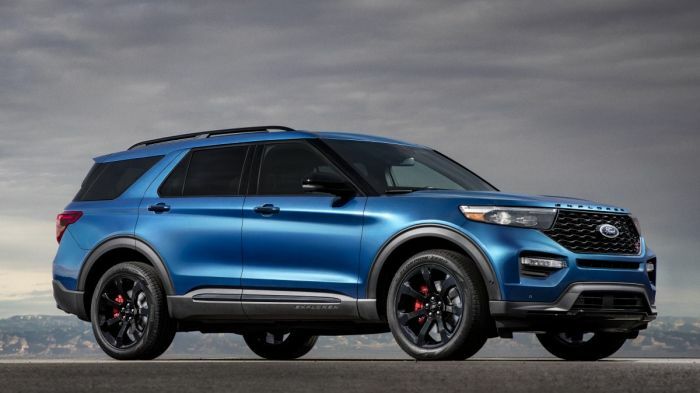 The 2020 Ford Explorer ST is based on the same architecture as the non-performance variants, but whereas rear-wheel-drive is standard in most other models, an advanced all-wheel-drive system is standard with this 400-horsepower SUV. The heart of this machine is the new 3.0-liter EcoBoost V6 which was first introduced in the new Lincoln Aviator that shares the underpinnings of the new Explorer. That horsepower is combined with 410 lb-ft of torque, sent towards all four wheels by means of a 10-speed automatic transmission that has been uniquely tuned for this high performance application, leading to a top speed of 143 miles per hour. Those who want greater performance from their Explorer ST can opt from two different performance packages – the ST Street Pack and the ST Track Park. Each of those upgrade packages adds 21-inch aluminum wheels and a performance brake package that includes larger, vented rotors, red painted calipers and larger pads, which varying levels of performance between the Street and Track package. While the performance capabilities of the 2020 Ford Explorer ST are the key aspect of this vehicle, the Motor Company engineers made sure that this new SUV fit the look of the ST lineup. On the outside, it has a black mesh grille, a liftgate applique, unique Explorer badging across the grille, roof-rack side rails and unique lower body trim. On the inside, the 12.3-inch digital gauge cluster similar to the one in the newest Mustang GT is standard, as is a flat-bottomed steering wheel with the ST logo, embroidered floor mats, and leather-wrapped sport bucket seats with silver accent stitching and the ST logo on the seat-back. Finally, the new Explorer ST comes with a Class III Trailer Tow Package with Cargo Management System and Active Park Assist 2.0, which makes pulling into and out of all sorts of parking spots quick and easy. After all, even the world’s quickest performance vehicles have to park once in a while and having them park themselves serves as a cool feature. We don’t have pricing for the 2020 Explorer ST just yet, but Ford representatives have stated that it will be under $60,000, so while it will be the quickest FoMoCo SUV yet, it will also be one of the most expensive in its size class.